Contractors are nomads. Every day they saddle up, secure their iron and roll to the next jobsite. Each new morning brings another mission, which means pros need a reliable rig to travel from point A to point B. They also need a comfortable and utilitarian chariot that can travel to jobsites that are off the beaten path. Sometimes there are no roads — on expansive farms, ungraded construction sites, far-off oil and gas projects or big, busy parks and university grounds. Those transportation applications call for a utility vehicle or UTV. Similar to their ATV cousins, UTVs are made for off-road applications, but differ in that they can take at least two passengers (sometimes six plus) and have a bed for cargo and supplies. Today, companies such as John Deere, Kubota, Polaris, JCB and KIOTI (along with a bevy of other big name corporations) manufacture a variety of 2×4, 4×4, 6×4 and 6×6 variations for both the commercial and recreational markets. Focusing on the former, this expansive spec guide covers the biggest players in the commercial UTV market, detailing products, specs and pricing. Peruse the next 12 pages and find your ultimate off-roading utility truck. Off we go. Since 1901, Cushman vehicles have been recognized light-transportation solutions for commercial and industrial applications. The Cushman Hauler line of rugged, versatile utility vehicles is ideal for a variety of applications in facilities and grounds management, construction and other industries and fields. The Hauler line offers numerous features to make daily tasks and maintenance more efficient, says Cushman. An optional limited slip differential provides for greatly improved traction and control on wet or loose terrain. Each Hauler vehicle features a standard steel brush guard and integrated front bumper to protect the body, finish and vehicle components from the wear of daily use and abuse. Large headlights integrated into the vehicle’s cowl are specially designed and positioned for maximum light dispersion in front of and around the vehicle’s front, for high visibility at dawn and dusk. The Hauler line features six different models, offering a variety of payload capacities and powertrain options. The Cushman Hauler 800 is available with either a quiet, zero-emissions 48-volt electric drivetrain or a high-torque, fuel-efficient 13-hp Kawasaki engine with a hemispheric combustion chamber. With a maximum capacity of 800 lbs, a 5.9-cu ft cargo bed and bench seating for two, the Hauler 800 is an ideal runabout vehicle for smaller tasks. 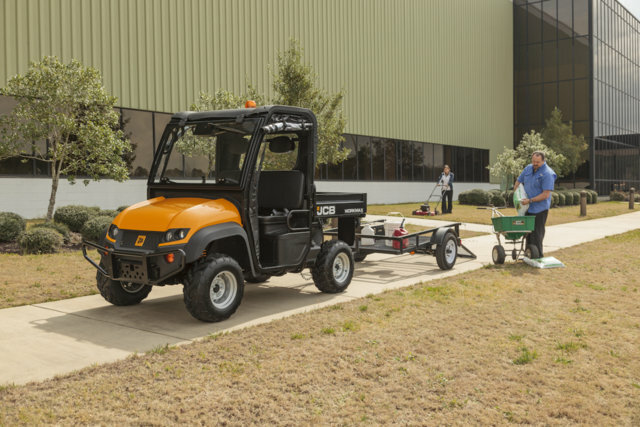 For larger jobs that require additional payload, the Cushman Hauler 1000 provides a total capacity of 1,000 lbs and a larger cargo bed of 9.6 cu ft. The Hauler 1000 is fully electric, with a zero-emissions 48-volt electric drivetrain with eight 6-volt batteries for more power and extended range between charges. For tasks that require even more cargo space, the Hauler 1000 can be built with an optional 14.9-cu ft aluminum cargo bed. The Hauler 1000’s bench seat can accommodate up to two people. With a 1,200-lb capacity and a 9.6-cu ft cargo bed, the Cushman Hauler 1200 is powered by a powerful yet fuel-efficient 13-hp Kawasaki engine and seats up to two people. The vehicle is also offered with an optional 14.9-cu ft aluminum cargo bed to handle jobs that require more cargo space. The Cushman Hauler 800X is available in either the quiet, zero-emissions 48-volt electric drivetrain or a gas-powered 13.5-hp Kawasaki engine. 20-in. aggressive-tread tires and a 5.9-cu ft cargo bed with power dumping options ensure the job gets done right. The Cushman Hauler 1200X is available as a fully electric model powered by a 48-volt drivetrain that offers a full 6 in. of ground clearance and a total capacity of 1,000 lbs or a gas-powered model that offers 5.3 in. of ground clearance and an 800-lb capacity. Both models feature trail tires and a 9.6-cu ft cargo bed; for jobs that require more cargo space, the vehicle is also offered with an optional 14.9-cu ft aluminum cargo bed. Manufactured with the toughest jobsites in mind, the Cushman Hauler 1500X features a 16-hp, 480-cc V-Twin engine, a 9.6-cu ft cargo bed and has a total load capacity of 800 lbs. It comes with a manually-locking rear differential and bucket seats that allow driver and passenger to complete the day’s work in comfort. Kubota has been producing the RTV Series utility vehicle line since 2004 and currently has two gasoline-powered models (the recently introduced RTV400Ci and RTV500) and three diesel-powered models (the RTV900XT, RTV1100 and RTV 1140CPX). The diesel models are heavy-duty worksite models targeted toward commercial users. According to the 2010 North American Utility Vehicle report by Power Products Marketing, Kubota is ranked No. 1 within the industrial segment, which includes construction, utilities and manufacturing. Starting in the lower range, the Kubota RTV400Ci incorporates a new, high-revving 16-hp air-cooled, single-cylinder gasoline engine with electronic fuel injection (EFI) and an advanced continuously variable transmission with an integrated clutch (CVT Plus). The RTV400Ci is also equipped with independent front- and semi-independent rear suspensions and a long wheelbase for a great ride, says Kubota. The RTV400Ci also has a standard metal cargo box with 9 cu ft, 441-lb load capacity and a contoured bench seat with obstacle-free leg room. The Kubota RTV500 comes with the comfort and technology of a larger UTV, but is compact enough to fit in the bed of a full-size, long-bed pickup. The RTV500 comes standard with Kubota’s Variable Hydro Transmission (VHT Plus), which eliminates the need to adjust belt drives and provides smooth, reliable transmission-assisted braking and hill-holding capabilities. The RTV500 has a durable, metal dumping cargo box with 9 cu ft, 440-lb load capacity and can tow up to 1,100 lbs. The Kubota RTV900XT is equipped with a powerful and efficient Kubota three-cylinder, liquid-cooled, 21.6-hp diesel engine and fully hydrostatic power steering for quick response. The RTV900XT has a hydraulic bed lift (optional on general purpose models), vinyl bench seats and the spacious steel cargo box, which easily carries a 48-in. pallet weighing 1,100 lbs, while simultaneously towing up to 1,300 lbs. Kubota offers RTV900XT accessories and attachments such as steel cabs, fully-hydraulic rotary brooms and snow blades, and other diverse options enable customization for an even greater degree of versatility. The Kubota RTV1100 is equipped with a Kubota three-cylinder, liquid-cooled, four-cycle, 24.8-hp diesel engine and responsive hydrostatic power steering. The RTV1100 is particularly adept at snow removal, offering hydraulically-powered snow blades and rotary brooms, sand spreaders and ice melt sprayers. It also offers the only standard factory air-conditioned cab in the segment, offering both heat and cool air for total operator comfort. The cargo box is a standard 16-cu ft bed with hydraulic lift that carries 1,102 lbs while simultaneously towing a load of up to 1,300 lbs. The Kubota RTV1140CPX features an innovative transformation system that quickly converts from one- or two-row seating options, allowing the operator to choose between additional passenger capacity or best-in-class 18.4-cu ft cargo space, depending on the task at hand. The RTV1140CPX work utility vehicle is powered by a three-cylinder Kubota diesel engine with 24.8 hp, four-wheel wet disc brakes and hydraulic power steering. Hydraulic bed lift is standard on all RV1140CPX models. John Deere started in the utility vehicle category in 1987 with the introduction of the five-wheeled AMT 600. In 1992, the first John Deere Gator models came to market. The 4×2 and 6×4 appeared on farms, on commercial jobsites, around schools and joined parks and recreation departments. Customers realized the benefits of carrying tools and materials around the jobsite, the farm and the home with a small vehicle that could do the similar work as a pickup. The Work Series models emerged in 2004 with the TS, TX and TH providing customers options. That same year, the HPX became the first 4×4 Gator model. Between 2007 and 2011, John Deere launched its cross-over category with the XUV 620i, XUV 625i, XUV 825i, XUV 855D and the XUV 550 and 550 S4. In 2012, John Deere launched its first recreational vehicle, the RSX850i. In 2013, two heavy-duty four seat models were introduced — the XUV 855D S4 and the XUV 825i S4. John Deere currently has 17 models available for the commercial contractor with multiple vehicle types. The XUV 825i is John Deere’s most popular Gator. This heavy-duty, four-wheel drive model features a 16-cu ft cargo box that can convert to a flat bed and has numerous attachment options and storage. The XUV 825i possesses 50 hp with a top speed of 44 mph. The Gator CX is a conveniently sized 4×2 model with an 8.5-hp engine. The Gator TS features 11 hp and a large cargo capacity combined with a light footprint on turf. The Gator TX features an increase in horsepower from the TS (15.5 hp) and delivers more torque, low-end lugging power, a larger cargo box and faster acceleration. The 4×2 model delivers a well-cushioned ride with a specially tuned four-wheel suspension. More power, more capacity and more wheels on the ground highlight the Gator TH 6×4 gas (15.5-hp) and diesel (18.5-hp) models. Both models are equipped with an extra-long wheelbase and low center of gravity for heavy-duty work, while also having a light footprint on turf. The Gator HPX 4×4 is the fastest work utility vehicle in the Gator lineup with a top speed of 25 mph, but it’s also the most terrain capable with true four-wheel drive and a dual range continuous variable transmission (CVT). The gas and diesel models also offer low steering effort, all-wheel hydraulic disk brakes and numerous options and accessories. The TX and TH models come equipped with a deluxe cargo box that has 16.4 cu ft of capacity, 20 integrated, tie-down points and converts to a useful flat-bed mode. A standard gas assist shock underneath the bed makes lifting and dumping effortless. In addition, a pickup style tailgate folds out to 90 degrees and down a full 150 degrees if you need it. Optional brake/tail light kit will help operators stand out on the worksite and a factory-installed spray-in bedliner is also available. John Deere’s newest models are the XUV 825i S4 and XUV 855D S4. These Gators allow for four passengers and convertible rear seat cargo space. When more cargo space is needed, the rear seat folds down in just seconds providing a flat platform with tie-down points that can hold an additional 200 lbs of payload. The 2013 XUV 625i, 825i and 855D also incorporate product updates such as an improved CVT and 40 percent more fuel capacity. Today, John Deere’s line of utility vehicles feature more than 300 attachments and accessories. Gators are designed for safety and stability, says John Deere, highlighted by roll-over protection structures (ROPS), three-point seatbelts and park brakes to name a few. The Gator line is unique in that John Deere offers a broad range of solutions with different cargo box sizes, suspension systems, passenger capacities, fuel options, EFI/carbureted engines and attachments. John Deere Ag and Turf Div. Headquartered in Wendell, N.C., KIOTI Tractor is a market-driven company that has been supplying more than 30 tractor models in the 22- to 90-hp range to the U.S. and Canadian markets for more than 25 years. Building on the company’s core product line, KIOTI has recently expanded its offerings to include the MECHRON 2200 UTV, “The Ultimate Transport Vehicle,” and the CS2410 subcompact tractor, as well as a full host of implements and attachments. Since its initial launch in 2011, the KIOTI MECHRON 2200 UTV has quickly gained popularity for its wide range of features for both work and play. With standard four-wheel drive and a 22-hp, three-cylinder, DAEDONG diesel engine, power and performance are unquestioned. The MECHRON’s 56-in. wide cargo bed is the largest in its class, capable of holding up to 1,100 lbs. Rugged roads and muddy conditions are no match for this UTV’s wide track, 12-in. wheels, 25-in. tires and 12-in. ground clearance. For a smooth ride over rough terrain, the MECHRON includes a MacPherson strut-like suspension up front and independent Dual-A arm wishbone with adjustable coil springs in the rear. An industry-leading 12-in. ground clearance creates a smoother ride on bumpy roads while helping to protect the underbody chassis even under heavy load/rough road conditions. For excellent maneuverability and steering ease, the KIOTI UTV features rack-and-pinion steering and a choice of heavy-duty, all-terrain, turf or UTV tires. Heavy-duty tubular steel frame construction and OSHA approved ROPS with seatbelts are standard equipment. Its wide track and ergonomic design allow for a wide bench seat on which up to three people can work or play comfortably. Standard equipment includes a two-speed continuously variable transmission, four-wheel disc brakes, a rear hitch receiver for a trailer, a convenient operator station with lots of storage compartments, halogen headlights and an excellent design for easy servicing. A wide range of options for the MECHRON include a hydraulic lift for the dump bed, front receiver, rear screen kit, windshield, work lights, fog lights and a dump bed cargo extender kit. Standard attachments and implements include a pull-behind spreader, wire unroller, eight-blade disc harrow with a culti-packer option, flip discs and chain harrows. The MECHRON UTV offers both power and agility, making it a market leader. Its superior design and solid structure provide the operator with both comfort and vast capabilities. Whether it’s transporting construction materials, or going for a trail ride, this ultimate transport vehicle makes any job more productive and recreation more enjoyable. Polaris started manufacturing the RANGER 6×6 in 1998 and in 2001, launched the RANGER 4×4. The company introduced its fifth generation for model year 2013, the RANGER XP 900 and more recently, the company’s first purpose-built commercial line, Polaris BRUTUS. The RANGER line has evolved with increased power, suspension, operator comfort and storage and has become the “hardest working, smoothest riding side-by-sides on the market,” says Polaris. Commercial customers have been utilizing Polaris’ RANGER, Sportsman and GEM lines for years and the company saw a need for vehicles specifically engineered for individuals and businesses that seek capable, durable task vehicles. So, this past March, Polaris introduced its new commercial line called Polaris BRUTUS, which consists of three models: BRUTUS, BRUTUS HD and BRUTUS HDPTO. The units are the company’s first purpose-built commercial vehicle line and the first side-by-side utility vehicle in the market to deliver front-end power take-off (PTO) capability, says Polaris. The units fit into Polaris’ total product strategy as the company now has a complete portfolio of vehicles available for commercial customers. Polaris’ commercial portfolio is quite vast. The RANGER line offers midsize, full-size, multi-passenger vehicles in powered by gas, diesel and electric means. Polaris Sportsman ATVs, such as the Sportsman X2 550 and Sportsman Big Boss 6×6 800 EFI provide single operator capability while the GEM cars provide everything from street-legal general transportation to utility needs, with near industry-wide usability in an eco-friendly, cost-effective and, of course, uniquely-styled package. Polaris’ newest BRUTUS models, BRUTUS, BRUTUS HD and BRUTUS HDPTO were built specifically for the commercial customer. They offer a 24-hp diesel engine with hydrostatic transmission which delivers all the torque and power needed to get the job done. An innovative treadle pedal allows travel in forward or reverse without shifting gears, providing an ideal setup for commercial applications. BRUTUS vehicles provide a class-leading 6 in. of suspension travel, which combined with on-demand true all-wheel drive, allows for safe and comfortable transportation of passengers and cargo over virtually any terrain. BRUTUS models are the first side-by-side utility vehicles that use a multi-link coil over De Dion rear suspension to deliver superior ride quality for commercial work applications. The rear suspension supports a 1,250-lb cargo capacity without sacrificing ground clearance and minimizes suspension sag when fully loaded. The suspension also maintains full class-leading ground clearance when trailering with its best-in-class 2,000-lb towing capacity. A pallet-sized rear cargo box features Polaris’ exclusive Lock & Ride cargo system for easy installation and removal of worksite accessories. The ability to operate several front-end attachments provides commercial customers with new levels of versatility, and ultimately, a cost-effective and more productive work solution. The Pro-Tach attachment system, standard on the BRUTUS HD and BRUTUS HDPTO, delivers work customers the capability to change from one attachment to the next quickly and easily. Creating levels of productivity never before seen in its class, a revolutionary, front-end PTO system on the BRUTUS HDPTO draws power directly from the vehicle’s engine. The high efficiency, mechanical PTO maximizes power to a line of purpose-built, out-front commercial attachments. Featured in the complete line of attachments are three PTO-powered attachments — angle broom, finishing mower and snowblower — and three hydraulically-powered attachments — snow blade, pallet forks and materials bucket — allowing users to sweep, mow, blow, lift, plow and scoop with just one machine. For optimal use of attachments regardless of weather, the BRUTUS HDPTO comes standard with a fully-enclosed, factory-installed cab with heat, defrost and air conditioning. Available Lock & Ride PRO-FIT cab components are pre-designed for the BRUTUS and BRUTUS HD frame and lock on tightly for a secure cab system. A full line of cab, storage and vehicle protection accessories also are available for the BRUTUS line to meet each commercial customer’s unique needs. Currently, JCB offers the WORKMAX 800D utility vehicle featuring a 20-hp Yanmar diesel engine. The WORKMAX 800D was introduced to the U.S. market in 2012; however, commercial JCB utility vehicles have been in production and sold throughout Europe since 2005. Sales volume of JCB utility vehicles has been increasing year-on-year, and 2012 saw the largest volume of sales to date. Today there is currently one JCB utility vehicle available in the United States — the JCB WORKMAX 800D. Further JCB utility vehicles will be introduced to the market place in the near future. JCB touts the WORKMAX as a robust, reliable, easy-to-use and easy-to-maintain vehicle in the eyes of its customers. JCB notes the WORKMAX is fuel-efficient due to its drivetrain layout and reliable Yanmar three-cylinder, 20-hp diesel engine, allowing users to go further and work harder. The WORKMAX has been popular with municipalities and rental dealerships alike, both of which have experienced significant cost savings by purchasing the WORKMAX, says JCB. The WORKMAX’s fully independent suspension with progressive-rate springs offers operators a smooth, comfortable ride. The WORKMAX’s bed is designed to hold pallets and has a strong steel frame and structure. JCB says the UTV is highly robust to handle attachments in the rear bed such as mesh sides, sprayers and salt spreaders. The JCB WORKMAX 800D offers a 1,323-lb (600-kg) maximum payload. The choice to combine a 784-cc Yanmar diesel engine with a two-speed continuously variable transmission (CVT) with Kevlar belt was a deliberate move to position the 800D WORKMAX model in the middle of the growing mid-range UTV volume sector. The 4×4 drive plus selectable differential lock is electronic. The 800D cab has a flat checkplate floor for uninterrupted access from either side of the bench or bucket seats. The WORKMAX’s undercarriage features a steel plate guard for major transmission components when engaged in unpredictable off-road environments such as forest trails or pastures. Likewise, to protect the engine during wading, the air intake is mounted as highly as possible — waist-high inside the front stowage compartment. Engine and CVT are positioned further forward than is the case on most UTVs. This is to achieve an optimum 50-to-50 weight distribution front to rear when fully laden. The WORKMAX was built with safety in mind, notes JCB. Certified ROPS as standard with interior locking seatbelts create a safe experience while in motion. A hand-operated park brake uses an independent mechanical disc to lock the vehicle, which also automatically engages four-wheel drive. Attachments are very key to customers and include rear plastic screen, rear mesh screen, hard door kit, soft door kit, lower door kit, interior mirror, work lights, road lights, beacon light kit, brush guard, front tow hitch, load bed liner and colored bodywork. The JCB utility vehicle is ideal for a large and varied range of users, both professional and recreational. Industries where a WORKMAX can be found working currently include gas pipe lines, ranching, hunting, rental outlets and municipalities to name but a few. Case IH introduced its utility vehicle lineup in 2010. Today, Case IH currently offers two four-wheel drive models — the Case IH Scout and Scout XL for agricultural and recreational applications. The Scouts have more horsepower and torque than the competition, says Case IH, yet can still fit in the back of your pickup for easy transport. The Case IH Scout XL also exclusively offers an all-wheel drive traction control system. The Scout offers 14 hp and a 5.2-gal gas-only fuel tank, and its cargo bed has a 425-lb capacity. The Scout XL offers a 6.5-gal fuel tank and either a 20-hp liquid-cooled diesel engine or a 23-hp air-cooled gas engine, both available with high-torque engine options. A full-size bed box on a rust-proof, aircraft-quality aluminum chassis still brings the total vehicle capacity of 1,600 lbs. The Scout is designed with a swing-arm rear suspension and AA front arm suspension to reduce body roll and side-to-side sway. For these models, an optional brush guard and 25-in. all-terrain tires are available. The Scouts come in either two- or four-passenger configurations, and you can get high-back bucket style seats. Although they can hit a top end speed of 25 mph, these UTVs are safe with certified ROPS and retractable safety belts, says Case IH. A continuously variable transmission (CVT) makes it feel like you’re driving a pickup truck. The Scouts are equipped with four-wheel hydraulic disc brakes and independent front and rear suspension, plus rack-and-pinion steering. A smooth-riding suspension system helps minimize the impact of riding over bumpy fields and ruts. The box is powder-coated steel with a rust-proof aluminum floor. For both models, a two-year, 2,000-hour warranty is available. You can trick out your Scout with a wide variety of options, including an electric bed lift, Realtree camo, gun rack, hard or soft cab, 12-volt electrical outlet, rotating beacon, turn signals, lights, fog lamps or winch. Overall, the Case IH brand represents a tradition of leadership. It is the culmination of great agricultural equipment companies and brands, including Case, International Harvester and David Brown, to name a few. Each of those brands has played an important role in the history and evolution of Case IH. Over the years, many things have changed, but the legendary red brand will always represent a commitment to making agricultural producers successful. If you’re looking for a “work first, play second” vehicle, then Case IH Scout utility vehicles are the right choice. These units were designed to be work vehicles. Case IH is a global leader in agricultural equipment. With headquarters in the United States, Case IH has a network of more than 4,900 dealers and distributors that operates in more than 160 countries.